When looking at networking basics, understanding the way a network operates is the first step to understanding routing and switching. The network operates by connecting computers and peripherals using two pieces of equipment; switches and routers. Switches and routers, essential networking basics, enable the devices that are connected to your network to communicate with each other, as well as with other networks.Though they look quite similar, routers and switches perform very different functions in a network. Routers, the second esteemed component of our networking basics and are used to tie multiple networks together. For example, if we would use a router to connect your networked computers to the Internet and thereby share an Internet connection among many users. The router will act as a correspondent, choosing the best route for your communication to travel so that you receive it quickly. Prof. Harald Haas coined the term “LiFi” at his TED Global talk to describe the high speed, bidirectional, networked and mobile wireless communication of data using light. Li-Fi is a bidirectional, high speed and fully networked wireless communication technology similar to Wi-Fi. 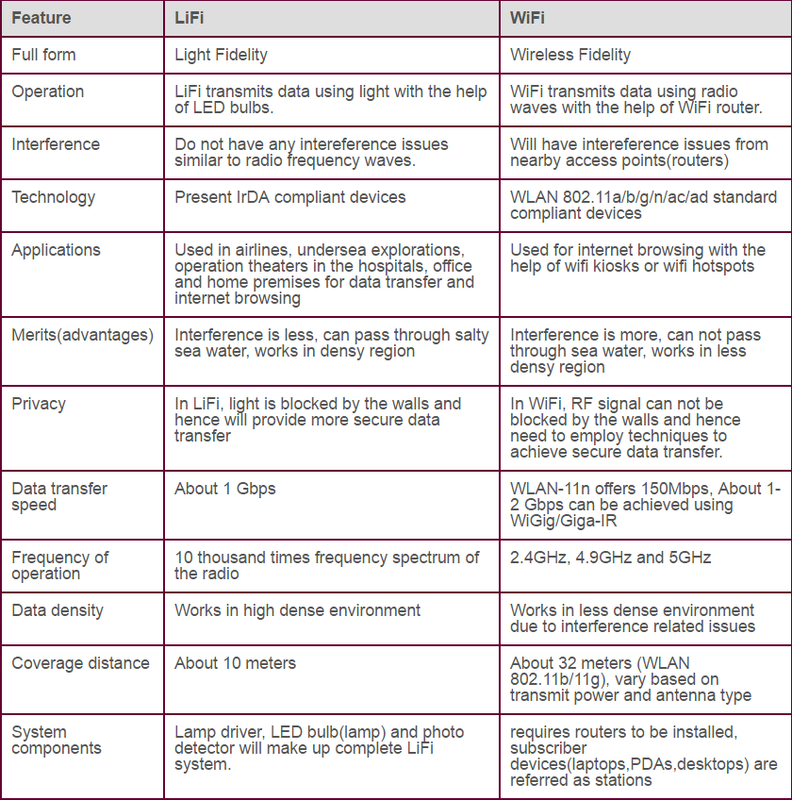 Coined by Prof. Harald Haas, Li-Fi is a subset of optical wireless communications (OWC) and can be a complement to RF communication (Wi-Fi or Cellular network), or a replacement in contexts of data broadcasting. Li-fi can deliver internet access 100 times faster than traditional wi-fi, offering speeds of up to 1Gbps (gigabit per second). It requires a light source, such as a standard LED bulb, an internet connection and a photo detector. It was tested this week by Estonian start-up Velmenni, in Tallinn. Velmenni used a li-fi-enabled light bulb to transmit data at speeds of 1Gbps. Laboratory tests have shown theoretical speeds of up to 224Gbps. It was tested in an office, to allow workers to access the internet and in an industrial space, where it provided a smart lighting solution. The term li-fi was first coined by Prof Harald Haas from Edinburgh University, who demonstrated the technology at a Ted (Technology, Entertainment and Design) conference in 2011. Prof Haas described a future when billions of light bulbs could become wireless hotspots. One of the big advantages of li-fi is the fact that, unlike wi-fi, it does not interfere with other radio signals, so could be utilised on aircraft and in other places where interference is an issue. While the spectrum for radio waves is in short supply, the visible light spectrum is 10,000 times larger, meaning it is unlikely to run out any time soon. But the technology also has its drawbacks - most notably the fact that it cannot be deployed outdoors in direct sunlight, because that would interfere with its signal. Neither can the technology travel through walls so initial use is likely to be limited to places where it can be used to supplement wi-fi networks, such as in congested urban areas or places where wi-fi is not safe, such as hospitals. As with traditional VLAN environment, routing between VXLAN segments or from VXLAN to VLAN segments is required in many situations. Because the current Cisco NX-OS releases (Release 6.1(2)I2(3) and earlier) don’t support VXLAN routing, specific designs need to be applied to achieve this network function. 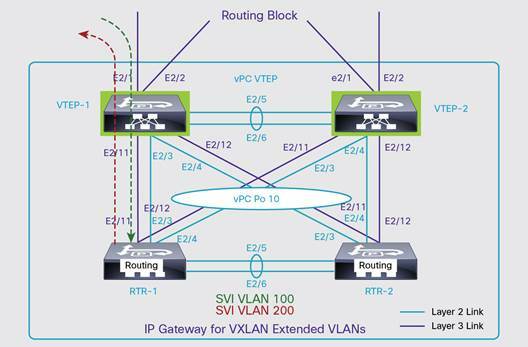 The routing block in the recommended design for VXLAN routing consists of a physical VTEP or vPC VTEP pair that converts VXLAN VNIs back to VLANs, and a router or a pair of routers that functions as the IP gateway for the VLAN IP subnets and routes between VLAN IP subnets. For device redundancy, redundant VTEP devices, such as a pair of Cisco Nexus 9300 as vPC VTEPs and a pair of routers running a first-hop redundancy protocol such as Hot Standby Router Protocol (HSRP), are recommended. Figure 16 shows a sample VXLAN routing block that is designed with two pairs of Cisco Nexus 9300 platform switches. One pair of Cisco Nexus 9300 platform switches functions as a vPC VTEP that maps between the VXLAN and VLAN. Note: Because of a known software issue, the peer links of the vPC VTEPs and the Layer 2 links to the routers in the routing block can’t be on the 40 Gigabit Ethernet links of Cisco Nexus 9300 platform switches before Cisco NX-OS Release 6.1(2)I2(2a). This problem is fixed in Cisco NX-OS Release 6.1(2)I2(2a). One alternative design for inter-VXLAN routing is shown in Figure 17. It has a VTEP-on-a-stick design, in which one or a pair of Cisco Nexus 9300 VTEPs is connected to the aggregation switches through a Layer 2 link and a Layer 3 link. The Layer 3 links are used to establish VXLAN tunnels with the in-rack VTEP access switches to extend the host VLANs across the Layer 3 network. The aggregation switches are configured with the host VLANs and switch virtual interfaces (SVIs) for their IP subnets. 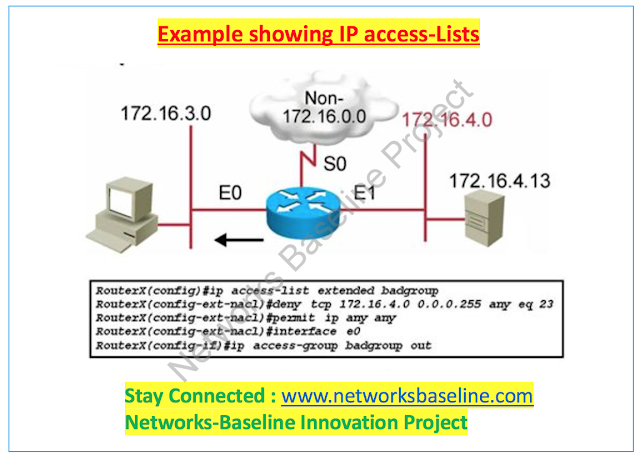 HSRP and Virtual Router Redundancy Protocol (VRRP) can be used to provide the first-hop redundancy with a Layer 2 link in place between the two aggregation switches. The Cisco Nexus 9300 VTEPs map the VXLAN VNIs back to VLANs and send the traffic over the Layer 2 links to the aggregation switches for inter-VLAN routing. After the packets are routed to the destination VLAN IP subnet, the aggregation switches will send the packets back to the Cisco Nexus 9300 VTEPs through the Layer 2 links for VXLAN encapsulation. The encapsulated packets will be forwarded to the destination rack through the underlay Layer 3 network. In this design, the added Cisco Nexus 9300 VTEPs extend the host VLAN segments and bring them onto the aggregation switches. The aggregation switches are the centralized IP gateway for the VXLAN-extended VLANs. The VTEP-on-a-stick design keeps the IP gateway of the VXLAN-extended VLANs on the aggregation switches, which preserves the IP gateway placement of the traditional Layer 2 data center pod. However, it may create blocks for migrating the network to a spine-and-leaf fabric architecture in the future. Currently Cisco Nexus 9300 platform switches support only VXLAN gateway and bridging functions. A planned future release of Cisco NX-OS will bring the VXLAN routing function to the Cisco Nexus 9300 platform, which will greatly simplify the network design for inter-VXLAN routing. In addition, Cisco is working on a BGP EVPN control plane for VXLAN. The current multicast-based VXLAN lacks a control plane and has to rely on flooding and learning to build the Layer 2 forwarding information base in the overlay network. VXLAN is a network virtualization technology. It uses MAC-in-UDP tunneling to build Layer 2 overlay networks across a Layer 3 infrastructure. This approach decouples the tenant network view from the shared common infrastructure, allowing organizations to build a scalable and reliable Layer 3 data center network while maintaining direct Layer 2 adjacency in the overlay network. Cisco Nexus 9300 platform switches can be physical VTEPs, providing hardware-based high performance. VXLAN functions on Cisco Nexus 9300 platform switches are quickly evolving, with inter-VXLAN routing and EVPN control plane functions already planned. After these enhancements become available, the VXLAN overlay design with Cisco Nexus 9300 platform switches can be further optimized and simplified. This solution will provide the data center network design for a Layer 2 overlay across a Layer 3 fabric to help provide the application workload mobility and network virtualization required by multitenant environments. 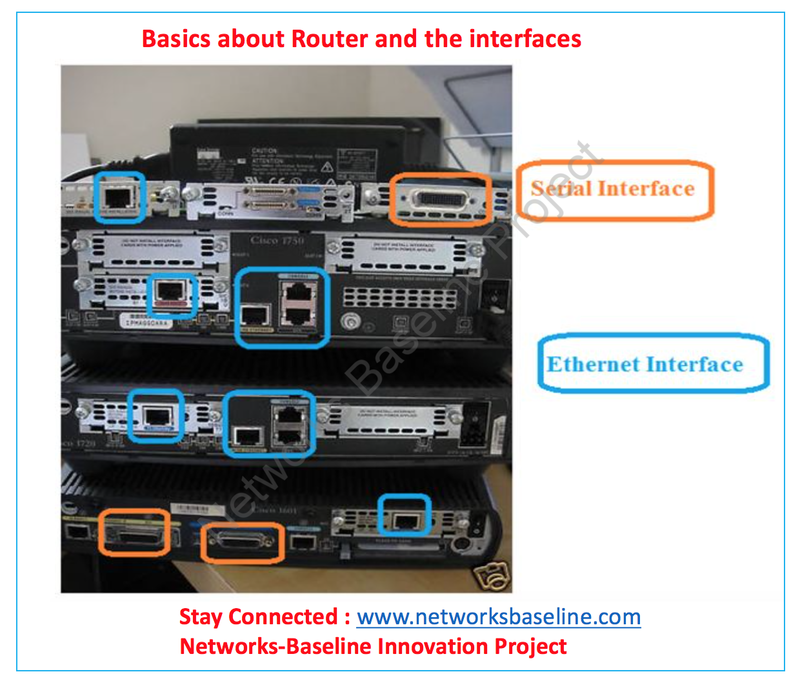 Lets talk about the basics of Cisco ASR 1002-X Router now, Similar with the ASR 1001-X Router but the difference is the inbuilt capacity in the ASR 1002-X Routers differ from ASR 1001-X Routers. Further we can also discuss the difference between the route processors and Embedded processors and the use of these processors in ASR Routers. ASR routers are generally used where we have the demand of the high bandwidth, likewise we have the customer and the capacity requirement for the WAN network is more and equal to 1 Gbps and in future the capacity increase to 2,5 or 10 Gbps, then can use ASR routers. Some of the requirement where we are providing solution in the DC and we need to provide the High end routers as CE routers, then we can have the ASR Routers. Note: - We can upgrade the back-plane capacity of the ASR routers by putting the license of Embedded processor like ESP-5, ESP-10, ESP-20. So we can upgrade the Back-plane capacity up-to 20 Gbps in ASR Routers. Further if you guys have any queries about the Cisco ASR Routers in terms of Hardware or the functionality of the routers, we feel free to contact us so that we can explain the information related to the Cisco ASR routers. Cisco ASR 1000 series Aggregation services Routers mixture more than one WAN connections and community offerings, which include encryption and traffic management, and forward them across WAN connections at line speeds from 2.5 to 2 hundred Gbps. The routers include each hardware and software program redundancy in an enterprise-leading excessive-availability design. The today's addition to the Cisco ASR circle of relatives is the Cisco ASR 1001-X Router, a single-rack-unit (RU) router helping 2.5- to twenty-Gbps forwarding ability. Cisco ASR 1001-X Router speeds may be “became up” incrementally to as an awful lot as 20 Gbps with a simple throughput improve license, rather than having to buy additional hardware blades or new routers. The Cisco ASR a thousand series helps Cisco IOS XE software program, a modular operating system with modular packaging, feature speed, and effective resiliency. The Cisco ASR one thousand collection Embedded offerings Processors (ESPs), that are based on Cisco Quantum float Processor technology, boost up many superior features which includes crypto-based totally access protection; community deal with Translation (NAT), thread protection with Cisco area-primarily based Firewall (ZBFW), deep packet inspection (DPI), Cisco Unified Border element (dice), and a numerous set of information middle interconnect (DCI) capabilities. those offerings are implemented in Cisco IOS XE software program without the want for extra hardware help. Enterprises experiencing explosive network traffic as mobility, cloud networking, and video and collaboration usage ramp up. Cisco ASRs consolidate these various traffic streams and apply traffic management and redundancy properties to them to maintain consistent performance among enterprise sites and cloud locations. Network service providers needing to deliver high-performance services, such as DCI and branch-office server aggregation, to business customers. Service providers can also use the multiservice routers to deploy hosted and managed services to business and multimedia services to residential customers. Existing Cisco 7200 Series Router (End-of-Sale) customers looking for simple migration to a new multiservice platform that delivers greater performance with the same design. 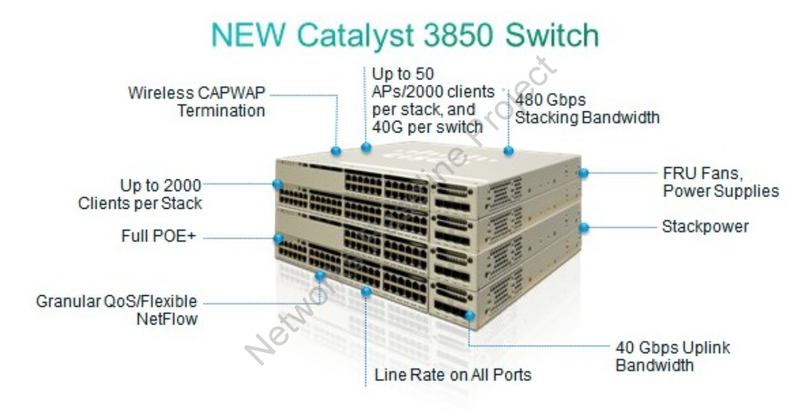 Cisco Catalyst 3850 is generally new Launched Cisco Switch with the Fiber Connectivity Capabilities. It can be used in the Data-Center environment for various purposes. The Cisco Catalyst 3850 Series is the next generation of enterprise-class stackable Ethernet and Multi-gigabit Ethernet access and aggregation layer switches that provide full convergence between wired and wireless on a single platform. Cisco’s new Unified Access Data Plane (UADP) application-specific integrated circuit (ASIC) powers the switch and enables uniform wired-wireless policy enforcement, application visibility, flexibility and application optimization. In addition to PoE (IEEE 802.3af), the Cisco Catalyst 3850 Series Switches support PoE+ (IEEE 802.3at standard), which provides up to 30W of power per port. The Cisco Catalyst 3850 Series Switches can provide a lower total cost of ownership (TCO) for deployments that incorporate Cisco IP phones, Cisco Aironet wireless LAN (WLAN) access points, or any IEEE 802.3at-compliant end device. PoE removes the need for wall power to each PoE enabled device and eliminates the cost for additional electrical cabling and circuits that would otherwise be necessary in IP phone and WLAN deployments. Table 6 shows the power supply combinations required for different PoE needs. BPDU Filtering, BPDU Guard, and Root Guard square measure s.t.p. security mechanisms. during this post i will be able to solely describe BPDU Filtering and BPDU Guard. These a pair of options give protection against spanning-tree loops being created on ports wherever PortFast has been enabled. a tool connected to a PortFast interface isn't alleged to send BPDUs however ought to this happen BPDU Filtering and BPDU Guard give protection. BPDU Guard and BPDU Filtering is organized in a pair of other ways, from world configuration mode or in interface configuration mode. In world configuration mode the feature (either BPDU guard or BPDU Filtering) can have impact on PortFast enabled port solely. In interface configuration mode it'll solely have an effect on a such that port. PortFast ought to be organized on port wherever bridging loops don't seem to be expected to make (which means no BPDUs ought to be receive on these ports), like on end-devices port sort of a single digital computer or server. PortFast provides fast network access by coming into directly in standard pressure forwarding state (bypassing listning and learning state). albeit PortFast will notice a bridging loop (While PortFast is enabled on a port, standard pressure remains running), it'll notice it in an exceedingly finite quantity of your time that's to mention the length of your time needed to maneuver the port through the traditional standard pressure states. If any BPDUs (superior to this root or not) ar received on port organized with BPDU Guard that port is place right away in errdisable state. BPDU guard should be configured on all switchs ports where STP PortFast is enabled. This prevents any possibility that a switch will be added to the port either intentionally or by mistake. BPDU Filtering allows to stop sending/receiving BPDUs on a port depending on how is configured. If it is configured from global configuration mode BPDU Filtering will be enabled on all configured PortFast ports. No BPDUs will be sent out of that port which will hide STP topology to end-users. But as soon as a BPDU is received the port will lose is PortFast status and BPDU Filtering will be disabled. If BPDU Filtering is configured from the interface configuration mode the result is completely different as this will cause the specific port to stop sending AND receiving (BPDUs are dropped) BPDUs. Tthe port ignores any incoming BPDUs and changes to Forwarding state. this solution is not recommended as it can result in bridging loops. Note: if you enable BPDU Guard on the same interface as BPDU Filtering, BPDU Guard has no effect because BPDU Filtering takes precedence over BPDU Guard. configuration of BPDU Filtering is not a recommended configuration. We are going to make R4 use both links when reaching prefixes on the internet. 25% of the traffic will go via AS2, and 75% of the traffic will go via AS3. Remember that load sharing is always considered in one direction. So we are only affecting traffic flowing from AS4 outbound to the internet. Let’s start by taking a peek on R4’s BGP table for the 100.100.100.0/24 prefix. You can see that R4 is preferring the path via R2 (2.2.2.2) to reach this prefix. This is because of a lower router-id (i configured #bgp bestpath compare-routerid). First off, let’s start by making R4 use both paths. What’s happened here is that the AS_PATH’s, although equal length, are not identical. This means we are still only using one of the available links. To fix this, we just need to use the hidden command shown below. The multipath attribute in the BGP table indicates we are now using multiple paths to reach this prefix. The routing table confirms this. All that’s left now, is to do some unequal load sharing. Here’s how we do it. The interface bandwidth command is entered in kilobits (which is why the values may have seemed to be a little weird). Anyhow, you can see from the output of the BGP & RIB table that a portion of the traffic is now shared between R2 and R3.